we are looking at a likely straw shortage this winter. For many years, using standard straw and chip bedding in the stable has been a custom. But these materials are also associated with a couple of drawbacks. First of all, the straw is easily drenched. Secondly, the straw amplifies the smell of excrements and urine. Lastly, the price on straw and chip bedding has been continuously increasing the past couple of years despite the quality of the product being the same. 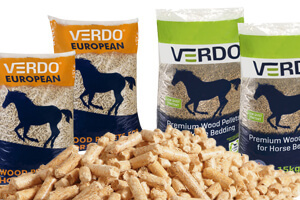 Using wood pellets from Verdo, you save money and improve the living conditions of your horse. The wood pellets are of a very high quality, ensuring a good night’s sleep for your horse - and a clean stable. Wood pellets from Verdo absorb well, up to three times their own weight. This leads to an improved indoor stable environment, and you don’t have to muck out as often as you do with straw. The wood pellets improve the level of hygiene due to the degree of heat they are produced at. The heat kills bacteria and other unwanted units. You save time due to the wood pellets being easily removable. You don’t have to remove all the wood pellets at once - just the dirty ones. Verdo wood pellets are cheap and available in bulk. The more you buy, the more you save per bag. Adding another layer to the cleaning argument, wood pellets block the smell of ammonia coming from the horse urine. When you are about to put the wood pellets to use, there are a couple of things you should be aware of in order to provide the best bedding for your horse. Start off by opening the bag of wood pellets and pour 5-7 litres of water into it. Shortly after, your wood pellets will be activated and triple in size. Once the wood pellets have absorbed all the water, tip them on the stable floor. You’ll quickly note that the pellets give your horse a steady and slip-resistant foundation that comes with less smell. 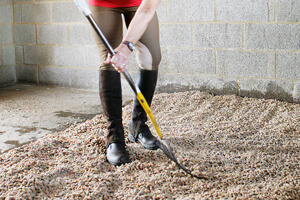 The horse bedding is now ready to use, and you can easily remove the dirty wood pellets whenever you want to. It’s easy to distinguish the dirty and clean wood pellets. Add a bag or two to the stable every week to make up for the removed pellets. Don’t activate the wood pellets with water if your horse is constantly wet or you want a dryer stable environment.